The Swim School is personally managed and maintained by Sean. Over twenty-five years he has developed a wealth of knowledge of the sport teaching children and adults alike. 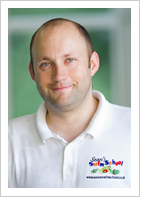 Sean is a Swim England Level 3 Coach, Open water coach and has swum at a National level. In his spare time, he has completed 7 English Channel crossings and Lake Windermere and is an Ironman. Sean was formally Head Coach of a local competitive swimming club for 20 years teaching and coaching children at all levels from those learning to swim to competitive swimmers including nationally ranked swimmers who have achieved their goals and fulfilled their dreams. The club competed in top competitions and won a variety of prestigious events and swimming galas. Having previously worked for a variety of other swim schools Sean has had first-hand experience of how children can develop successfully to gain confidence and learn the all important skills in the water to achieve their full potential.